GLOGIRLY: UPDATE! 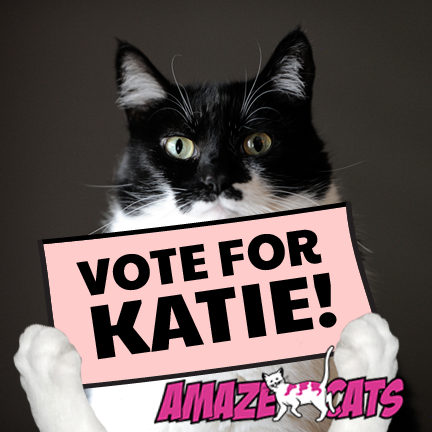 Ok, NOW Can You Please Vote KATIE! Leave it to Waffles to screw up my official voting announcement. For those of you who visited earlier this morning and tried to vote but couldn't... well you can blame it on the orange menace. That's ONE thing he's good for. Voting is OPEN NOW through 2:00pm EST Thursday on Facebook for AmazeCats Next Top Cat. I'm up against some powerhouses that have leaped out front. So I need your help to make it to the next round. I would appreciate it ever-so much if you'd click the little button next to my name. And if your dog has a Facebook account... can you please get him to vote too? We voted again just in case we botched it up this morning. Have a wonderful Wednesday. We voted Katie! Good luck! As usual, the Facebook problem. I guess that is how they keep people to only one vote. But it stops us voting. Good luck. You got 3 votes from our condo! Voted, posted on Z-Girl's page AND our Squeedunk page! Goooooooo Katie!!!! We are voting Katie! Mes even gots Beary Good Stuff and all their Friends to Votes too!